Fry the onions with the lardons in a non-stick pan or a wok until the lardons are crispy and the onions are soft but still retain their shape – about 5 minutes. Remove the lardons and onions from the pan, cover and keep warm. 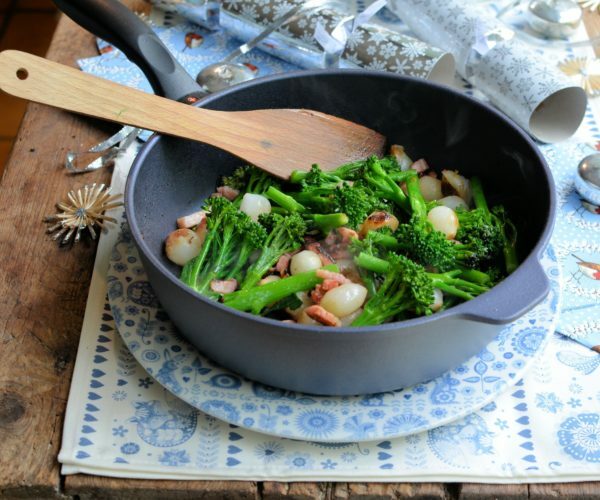 Add the Tenderstem® and fry for 4 to 5 minutes, stirring all the time; add the cooked lardons and pearl onions back to the pan with the Tenderstem® and add the butter, to coat and “glaze” the onions and the Tenderstem®. Season with salt and pepper to taste and serve immediately in a warmed serving dish.